There was chaos in Egbe, in the Ikotun area of Lagos State, when some homo-s*xuals allegedly fought one another after contracting the Human Immunodefeciency Virus. According to Punch, Ezeugo had reportedly brought in another boyfriend to the house and was about to make love to him when the first boyfriend raised the alarm around 3am on Tuesday. It was learnt that policemen from the Ikotun division were invited by residents and the suspects were arrested. A police source said the prime suspect, Ezeugo, confessed to have been a homo-s*xual for about five years. He said, “We got a distress call from residents around 3am that there was a fight among five homo-s*xuals living together in a room apartment. “On getting there, we were told that late that night, the neighbours heard a noise and thought a thief had broken into the house. But they later discovered that the noise came from the room where the men stayed and that they were fighting. 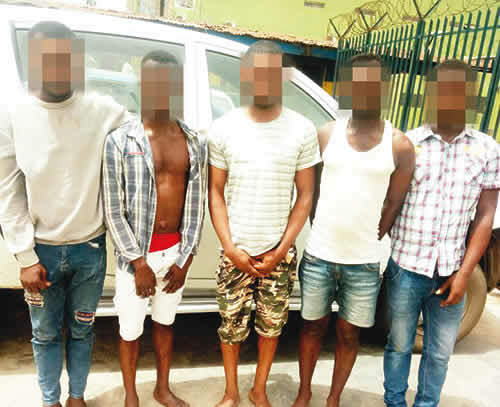 “The tenant who accommodated the others, Ezeugo, had gone out to bring a new gay partner and was about to sleep with him when his first lover protested that he could not be sleeping with him and his tribesman from Calabar, Cross River State.